Universal Audio's latest plug-in is an audacious attempt to bridge the gap between the project studio and professional recording environments. Apart from the skill of the musicians, producers and engineers, the main differences between the capabilities of a modern home studio and a big-name studio are down to the choice of quality microphones available in pro studios, and to the acoustics of the recording spaces themselves. In developing the Ocean Way Studio room-modelling plug-in for the UAD platform, Universal Audio have tackled both of these differences. The plug-in models both the sound of LA's revered Ocean Way's rooms and of the studio's unparalleled collection of vintage microphones, in a format that allows them to be applied retrospectively to existing recordings, or live in real time if you're using one of UA's Apollo interfaces. As if that weren't enough, you actually get a fair amount of engineering skill thrown in as well, because the plug-in was developed in conjunction with Allen Sides. Not only does Sides own Ocean Way, but he is also a hugely experienced engineer and producer who knows all about where best to place instruments in the Ocean Way rooms, what mics to use and where to put them. If you disagree with his choices, there's the option to change them, but his presets provide a valuable starting point in achieving a classic sound. UA's dynamic room modelling methodology took over three years of detailed research to optimise, which isn't surprising when you consider what it involves! Although impulse responses are used as part of the process, to reproduce the direct sound path from source to microphone, the room reflections themselves are entirely modelled, as convolution techniques can only capture snapshots of one set of source and mic positions. If you need to be able to move things around in the virtual room, modelling provides a more flexible option. 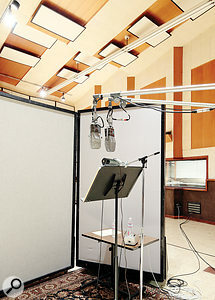 Not only have UA modelled the microphones and rooms, a process which apparently involved developing new measurement techniques, but their algorithms also take into account the dispersal patterns of the sound sources themselves in relation to the room and microphones. Not all instruments radiate sound in the same way, so UA have attempted to capture the 'firing' patterns of drum kits, guitar cabinets, pianos and so forth. 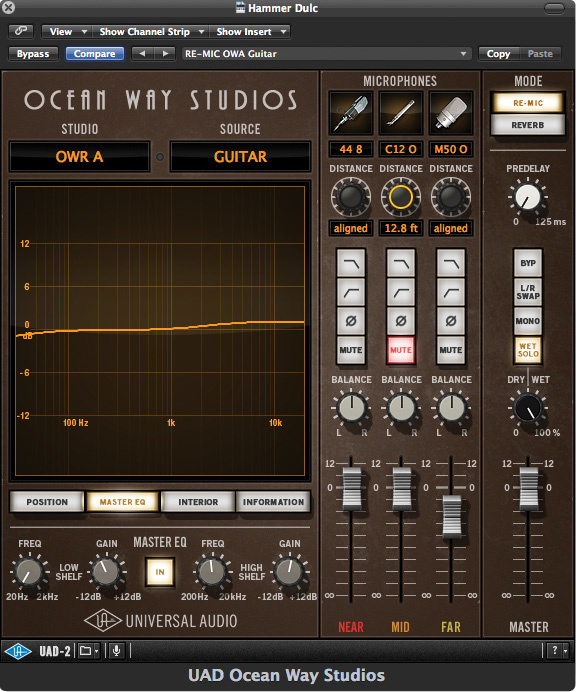 As well as the high- and low-pass filters on each microphone group, Ocean Way Studio also features master EQ. 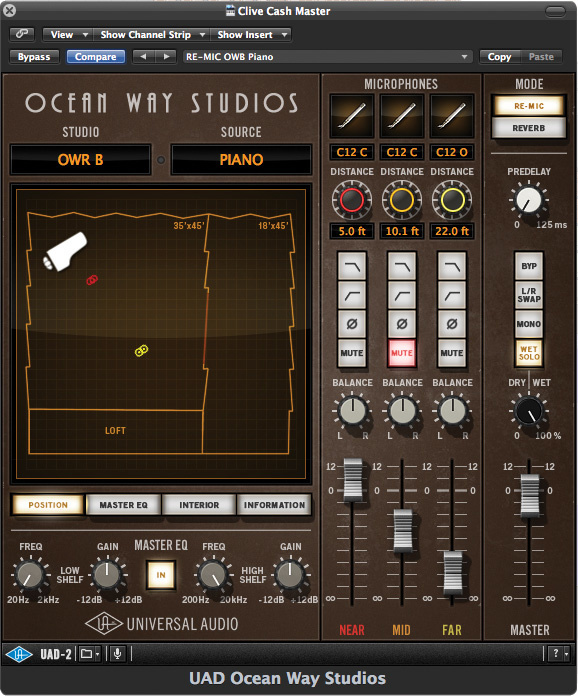 The plug-in's graphical user interface shows a plan view of the studio and gives access to a selection of Ocean Way's microphone setups. Allen Sides' presets are based on his tried and tested configurations for each type of sound source, and up to three microphone pairs, entitled Near, Mid and Far, are available, with faders to blend in their individual contributions. Separate presets are available for the two operational modes, which I'll get to in just a moment. There's also the option to time-align the mics, should that be required, and the output can be further processed using the plug-in's EQ and high-cut/low-cut filters. Real-life artifacts, such as mic bleed and microphone proximity effect, are included in the modelling process. There are two modes of operation: Reverb and Re-Mic. In Reverb mode, the plug-in is used via an aux send/return path to add room ambience to a dry sound, just as a conventional reverb might, and the direct path component of the modelling is removed, to avoid potential phase problems that might otherwise arise when the dry sound and emulated direct sound are layered. In Re-Mic mode, by contrast, the entire signal is processed, and the dry sound replaced by the modelled direct sound component. If your original recording is reasonably dry, this mode allows you, in effect, to place your sound source within the Ocean Way room. The Mix button is locked out in this mode, as it is intended to be used 100 percent wet as an insert effect. In addition to the choice of mics, which can be selected independently for the Near, Mid and Far locations, you can also choose from a selection of different source types. The choice affects how reflections are generated in different directions and subsequently picked up by the room mics. There are eight instrument and voice sources, designated Drums 1, Drums 2, Strings, Horns, Piano, Vocal Group, Vocal Solo, Guitar, Cabinet M, Cabinet V and Cabinet O, the last being available only for Studio B. All these appear at their optimum location in the virtual rooms. A Distance control adjusts the spacing between the source and the chosen microphones, while clicking a mic's Distance control turns time-alignment on, compensating automatically for the time delays between the source and the other mic arrays. Switchable high-cut filters, all with a gentle 6dB/octave slope, are available set at 10kHz for the close mic, 8kHz for the Mid mic and 6kHz for the Far mic. Low cut is also switchable, and this time operates at 12dB/octave, with corner frequencies of 50Hz for the Near mic, 75Hz for the Mid mic and 150Hz for the most distant mic. Polarity-inversion buttons are available for each mic pair, along with the option to mute or solo any individual mic pair. There's also a stereo balance control, a gain control and a master two-band EQ section with variable frequency and gain. For the outputs, there is variable gain, a mono option that emulates single mics rather than pairs, and a wet solo button. There's also the ability to swap the left and right channels, plus a variable pre-delay setting of up to 125ms, accessible only in Reverb mode. The available microphones vary depending on the sound source chosen, but include emulations of the AKG C12, Neumann's U67, U47, KM54 and M50, a Shure SM57, an AKG C414 and Sennheiser MKH20. The best way to use the plug-in is probably to start with the presets, as these all represent classic setups. Once you've got a feeling for what's possible, you can start to experiment with turning various mics on or off, adjusting their balance and changing the microphone type. Alternatively, of course, if you have a clear idea of what sort of mic placement you want, you could pick a source and a studio (A or B), then enter your own mic choices and distances. In the presets that use the fully immersive Re-Mic mode, the room can sometimes sound a little too prominent, but that can be solved by engaging a close mic if there isn't one set up already and then varying the mic distance and level until you get just the right amount of roominess. In Reverb mode, where you control the dry/wet balance, the degree of 'roominess' is much easier to manage, but you lose the effect of the dry sound being processed via the room mic model. There's also an audible increase in focus if you decide to switch on the time-alignment feature, although this comes at the cost of eroding the natural sense of space and perspective that using the mics au naturel creates. In concept, what this plug-in does is fairly straightforward, but the degree of sonic realism it adds to a recording is surprising. In a typical home-studio context, where all sources have to be close-miked or DI'd, it can be hard to escape the feeling that everything is right in the listener's face. The UA Ocean Way Studio plug-in does a great job of pushing things a little further away, creating a sense of space, adding front/back perspective to the various elements in a mix, and smoothing out harsh high frequencies. Used as intended, it adds a real sense of life and space to piano and drums, for instance, but you don't have to use the presets for their intended purpose. For example, the piano setting can work well on acoustic guitar or even on a complete mix, although for the most controllable results you'll probably want to use two or three instances of the plug-in to process submixes or individual tracks. Power demands are reasonable: I found the plug-in took up around 10 percent of the DSP capacity of my Quad UAD2 card. 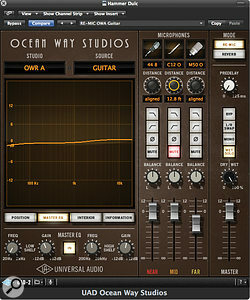 As faster CPUs make DSP add-ons increasingly unnecessary from the point of view of computer power, the success of platforms such as the UAD2 will depend on Universal Audio being able to offer unique plug-ins, and Ocean Way Studio is a perfect example. There are, as far as I'm aware, no direct counterparts in the world of native plug-ins, although there are certainly processors that could be put to similar uses in some circumstances. For instance, EastWest's Quantum Leap Spaces is a convolution reverb that offers 'source specific' impulse responses tailored for particular instruments, miked using vintage microphones in a specific hall. However, being purely convolution-based, it doesn't offer any flexibility beyond choosing a different preset, whereas with the Ocean Way Studio plug-in you have a lot of control over position, distance, mic choice and so on. At the other end of the spectrum, the Flux IRCAM Tools Spat plug-in is a purely algorithmic psychoacoustic processor that enables you to convincingly 'place' individual sound sources within a virtual acoustic space. In some ways, this offers even more control than Ocean Way Studio, as you can adjust not only the distance and angle (pan position) of the source, but also rotate it so that it fires in any direction with respect to the listener. Spat also works in surround, and by using it on a multi-channel track, you can position multiple mono or stereo sources simultaneously in the same instance of the plug-in. Although the algorithmic reverb that underlies Spat is a very good one, though, it does not model a specific space in the way that Ocean Way Studio does; nor does Spat simulate microphones and their placement within the space. I didn't expect to be so impressed with this plug-in, and I was particularly sceptical about using it on material already coloured to some extent by mic and room choices, but in reality it does a great job as long as the original recording isn't too wet, and I can see it getting a lot of use in the future. Now that UA have got this process to work, I can't help but wonder what studio they might want to have a go at next! The live room in Ocean Way Studio B. UA's modelling extends to many of the studio's classic microphones, including these RCA 44 ribbon mics. 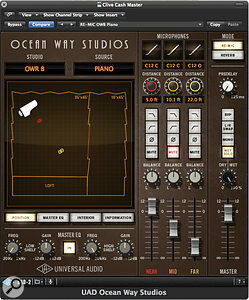 Having developed their studio-modelling technology, Universal Audio chose to use it first in modelling Ocean Way Studios in Los Angeles, in part because of the Bill Putnam connection. Bill, UA's founder, opened United Recording in 1957, and annexed the neighbouring Western Studio complex in 1961. After much wheeling and dealing between Bill Putnam and former speaker designer Allen Sides, the tale of which would make an entertaining book in its own right, the studio known as Ocean Way Recording came into being. 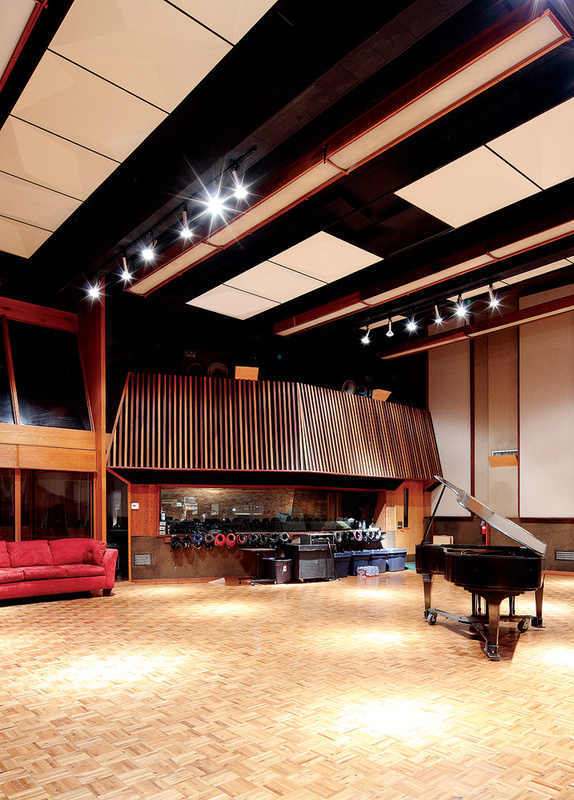 Since then, Ocean Way Studio A and Studio B have hosted the recording of many classic tracks by the likes of Frank Sinatra, Ray Charles, the Beach Boys, the Rolling Stones, Michael Jackson, U2, Tom Petty, Red Hot Chili Peppers and countless others. For more on the history of Ocean Way, and more beautiful photos illustrating the rooms that were modelled for UA's plug-in, turn to this month's Studio File feature. Studio A is the more spacious of the two rooms. Measuring 45 x 52 feet, its acoustic is characterised by a clear low end and a smooth decay. Studio B, which was designed by Bill Putnam, has been described as "a miniature concert hall”, and measures 35 x 45 feet, while a separate isolation room measuring 18 x 45 feet is popular for guitar recording. All three spaces are modelled here, and the guitar-cab room is part of the Studio B selection, running alongside Studio B. Easy to use, and more flexible than purely convolution-based systems. Great presets based on standard Ocean Way setups. Limited number of sound source and source placement options. This plug-in presents a practical alternative to synthetic or convolution reverb for adding a sense of space and place to a recording, with the added bonus of Allen Sides' experience in choosing the room positions and mic setups.